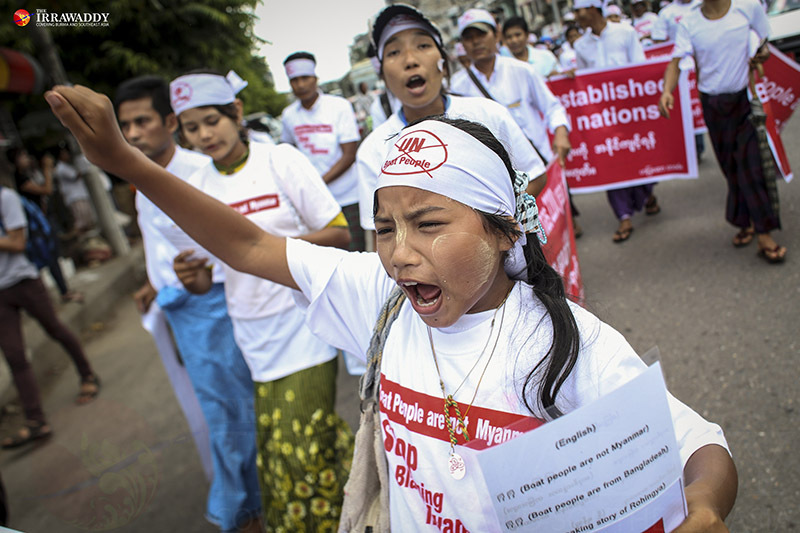 Around 300 people joined a protest in Rangoon on Wednesday to call for an end to international pressure on Burma over the Bay of Bengal migrant crisis. RANGOON — Around 300 people joined a protest in Rangoon on Wednesday to call for an end to international pressure on Burma over the Bay of Bengal migrant crisis. 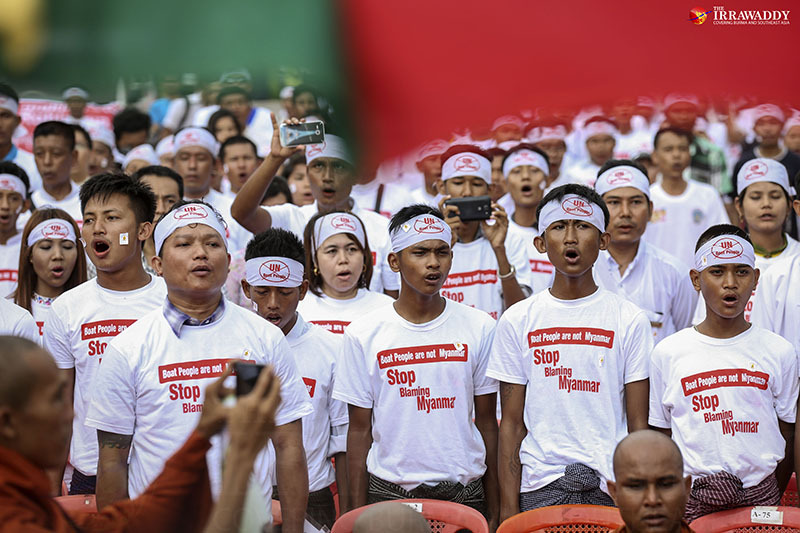 Wearing shirts that read “Boat People are not Myanmar, Stop Blaming Myanmar”, the crowd marched around the Kyaikkasan Grounds in Tamwe, declaring that Burma had not contributed to the exodus of boat people from Arakan State and Bangladesh in recent months. 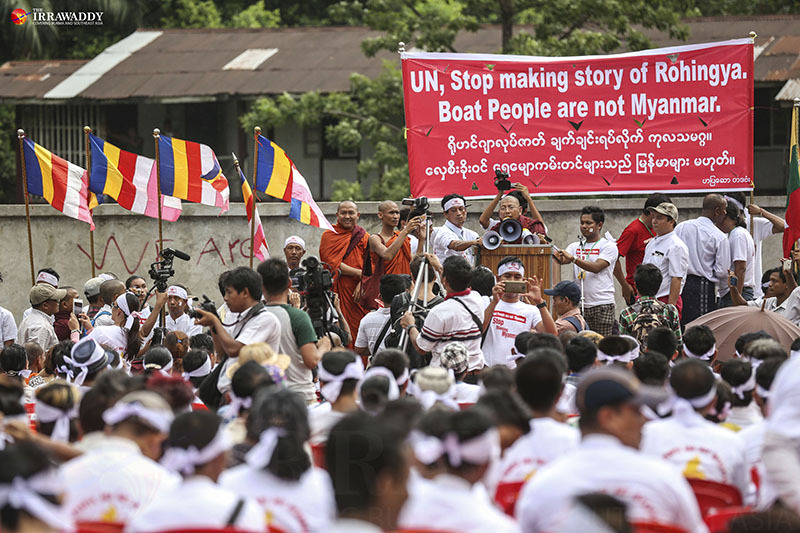 “Boat people are from Bangladesh, stop making [up the] story of Rohingya, stop lying for Rohingya, [there are] no Rohingya in Myanmar,” the demonstrators shouted in Burmese and English. Unlike previous anti-Rohingya rallies, The Association for the Protection of Race and Religion, led by Buddhist nationalist monks, appeared not to be responsible for the mobilization, though a contingent of monks from the group did participate. Organizers told the Irrawaddy that the midday rally was arranged by Ha Pyar Zar (Arakanese for “Golden Pagoda”), an umbrella group which brought together the nationalist organizations Rakhine Youth, the Myanmar National Network and Rakhine Rakeda (Protect the Arakan People). Maung Maung Kha, one of the rally organizers, said that the demonstrators had sought and failed to receive permission from the government to protest in front of the United Nations offices in Rangoon. In a May 19 joint press release, the UNHCR and the International Organization for Migration said that 25,000 migrants and refugees from Bangladesh and Myanmar had made the voyage across Andaman Sea in the first quarter of 2015. Nearly 1,000 people are believed to have drowned. Deputy US Secretary of State Antony Blinken, told a Rangoon press conference on May 22 that more than half of those embarking across the Andaman Sea were from Arakan State. “Our best information, based on the work that we’ve done with the United Nations is that a significant number, a majority, are in fact from Rakhine State, are Rohingya, and left because of desperate conditions that they faced in Rakhine State,” he said. Senior monk U Thuta Nanda, a South Okkalapa resident, said he was motivated to join Wednesday’s protest by his concerns that the Muslim population of Burma would increase dramatically due to an influx from neighboring Bangladesh. He claimed that Burma’s Muslim minority was attempting to join the governing Union Solidarity and Development Party (USDP) and the opposition National League for Democracy (NLD), the country’s two largest political parties, in an attempt to steer the country towards Muslim doctrine. U Thuta Nanda added that the Burma Army needed to remain stationed in Arakan State, or the entire region would become Muslim-dominated. According to the Pew Research Center, 3.8 percent of the total population of Burma was Muslim, a figure that is expected to remain static through to at least 2030. A phone call to NLD lawmaker Min Thu confirmed that his party presently had no Muslim MPs sitting in the Union Parliament. A survey of the Parliamentary Handbook, published by Myanmar Consolidated Media, found that of the USDP’s 336 MPs in the Union Parliament, a total of three belonged to the Muslim faith. Additional reporting by Kyaw Phyo Tha and Yen Snaing.